Teachers from six Tennessee Valley states gathered last week at Lake Guntersville, Al. to attend TVA Plant Camp. This three-day workshop for middle and high school teachers and environmental educators is led by TVA experts who teach them about the Valley’s vast and unique eco-systems. 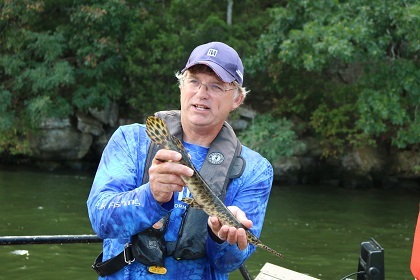 "We are trying to get our teachers out to expose them to the amazing diversity of species and amazing ecology we have right here in our backyards," said Brett Hartis, TVA Aquatic Plant Management program manager. The competition to get one of the 24 spots is fierce; this year over 70 teachers applied. According to Mr. Hartis the camp involves more than plants. Teachers also learn about fish, bats and how TVA uses fire to promote habitat for land plants and animals. "The Tennessee Valley is about three times more diverse than all of Europe,” said Mr. Hartis. “Many of them [teachers] were not aware of that, but they've seen a lot of different species that we have right here at Lake Guntersville." Kimberly Pack, a middle school teacher from Fannin County, Ga. cannot wait to get back to use this information with her sixth, seventh and eighth graders. “It is a big opportunity for my students. We have a stream at our school and Blue Ridge Lake. We can study plants and see if non-native plants are taking over. I think they will be excited about it,” she said. In addition to the course, TVA provides resource materials that teachers can use to augment their regular curriculum to help push lessons further. Decoda Muller, administrator of the T.O. Fuller State Park Interpretive Center in Memphis teaches students about environmental literacy. He said, “TVA Plant Camp is the best way to learn and be taught. Hopefully the enthusiasm you get from seeing it in person will translate to the kids you teach."